A quirky teen romantic drama with plenty of heart and some humour, Say Anything... is a refreshingly different perspective on the turbulence of young love. High school is coming to an end, and free-spirited average student Lloyd Dobler (John Cusack) has decided to pursue the beautiful and super smart class valedictorian Diane Court (Ione Skye). Beyond dabbling in kickboxing Lloyd has no idea what he wants to do in life, while Diane's future has been carefully crafted by her father Jim (John Mahoney), and includes relocating to Europe to take advantage of a prestigious college fellowship. Nevertheless Lloyd and Diane start dating and develop a serious relationship, bordering on love. Jim is generally unsupportive of his daughter's new friend. But then Jim is suddenly accused of tax fraud and embezzlement through his seniors' care home business, Diane's life starts to unravel and Lloyd is caught in the turmoil. The directorial debut of Cameron Crowe (who also co-wrote the film) is an engaging teen romance that finds a natural tone and avoids most of the subgenre's contrived traps. Much of the credit goes to Crowe's writing, which seeks to create two real young people, both uncertain, tentative and yet possessing the courage of youth to explore what appears to be unlikely. This is a teen movie where Lloyd's best friends are two girls (Corey and D.C., brought to life by Lili Taylor and Amy Brooks), there are no body fluid jokes or gross pranks, no evil school principles, or indeed, any antagonists. Lloyd does not even have any competition for Diane's heart. Instead the central conflict resolves around the perfect future of success carefully crafted for Diane by her father Jim. Lloyd enters the picture as figure of disruption from Jim's perspective, and again Crowe demonstrates a welcome maturity: rather than exhibiting any domineering behaviour, the father's response is surprisingly mute, his resistance a sophisticated mix of passive aggressiveness and preying on Diane's feelings of guilt. Diane and Lloyd share the background of broken homes, although neither is deprived or unhappy. As a child Diane had to choose between her father and mother when they separated, while Lloyd has been deposited at his sister's house (an uncredited real sister, Joan Cusack), a single mom herself suffering through a broken relationship. Lloyd's household mission is to try and cheer up his sister while fully enjoying playing uncle to her young son. John Cusack was already moving into more adult roles but here perfects his cool outsider student persona, and is the best thing about the film. 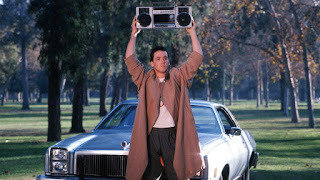 Cusack allows Lloyd's unique identity to propel his audacity, exploiting the character's lack of a life plan to best effect and nailing the iconic boom-box-in-the-air ode to love moment. Ione Skye is adequate as Diane, while John Mahoney gets one of his most prominent big screen roles, adding to the sense of realism as a protective but not naive father. With plenty to say about life unfolding in untidy directions, Say Anything... speaks with understated eloquence.